Extant research has been focusing on the effectiveness of social media in driving consumer engagement and interaction. 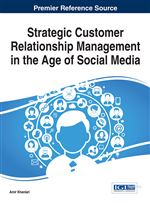 However, little research has examined how social media influences firms' Customer Relationship Management. This chapter fills this gap by proposing a conceptual framework to capture the impact of social media on traditional Customer Relationship Management in the context of consumers' organic food purchasing. Specifically, this study investigates how social media influences the purchase behavior of loyalty program members and non-loyalty program members. This study also examines the effectiveness of different types of social media content on consumer purchase behavior of organic food. Why The Organic Food Industry? First, a note on the growing organic food or ‘healthy eating trend.’ Since the 1960s, food consumption has transformed alongside the breakdown of mass-consumerism in its replacement by a multi-dimensional, dynamic society (Beharrell & Crockett, 1992). Within this transformed society, individuals are constantly searching for ways to express their personal and collective identities, values and beliefs. One way in which individuals are achieving this new found self-expression is through their healthy food choices. Food consumption has essentially become an ‘expression of personal identity and group affiliation within an increasingly fragmented social structure’ (Beharrell & Crockett, 1992: 5).